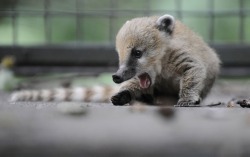 Male coatis live alone and females are found in groups. In mating seasons, however, they meet and reproduce. When a female is ready to have babies she leaves the others and makes a nest in a tree, and only rejoins her group when the offspring is around 6 weeks old. Pregnancy lasts for 74-76 days!